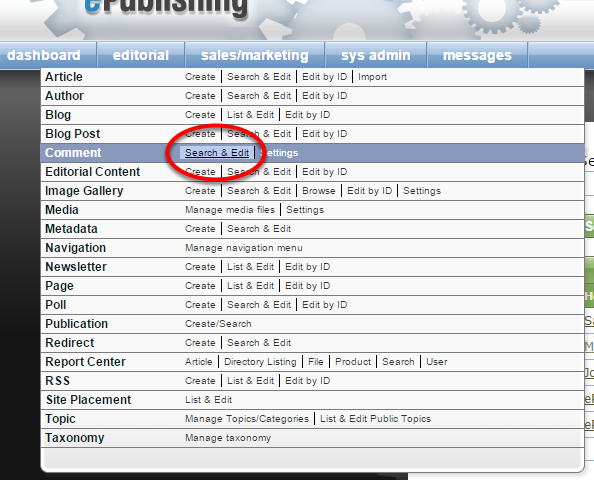 ePublishing Knowledge BaseePublishing Knowledge BaseePublishing Knowledge Base EditorialHow do I manage comments? For ePublishing websites that are using third-party commenting solutions such as Disqus and Gigya, refer to documentation provided by those solutions. After reviewing this article, learn more about limiting the spam in comments: How do I limit spam in comments? 1. Access existing comments in the Comment Manager under Editorial. Select Search & Edit. You may also access comments under Sales/Marketing. Both links will access the same comment database. To moderate comments for a specific article, post, product, or listing, you can also open Comments from the Edit drop-down menu in the article, blog post, product, or directory tool. 2. Select the comment type you'd like to review. Zoom: Select the comment type you'd like to review. You may sort your results by begin and end dates, offensive or inoffensive and active or inactive. 3. In the search results, quickly review comment status, the full comment, the associated content (article, blog post, etc), the comment poster and more. Zoom: In the search results, quickly review comment status, the full comment, the associated content (article, blog post, etc), the comment poster and more. 3.1. 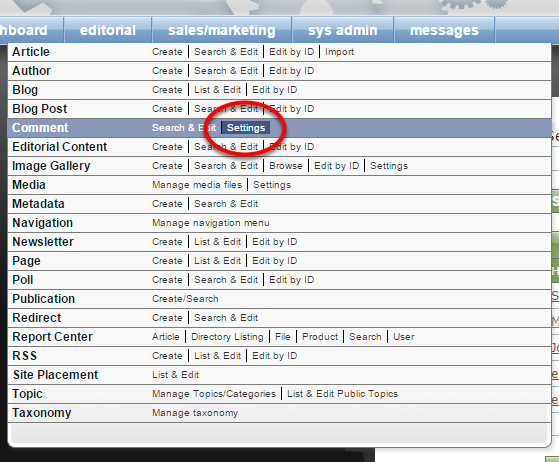 Delete or activate comments directly from the search results if desired. 4. Select the comment you'd like to view. 4.1. You may edit the comment's title or body to fit site guidelines. Zoom: You may edit the comment's title or body to fit site guidelines. 4.2. Set the status of the comment. Mark a comment as offensive or inoffensive. When inoffensive, the background of this area is white when viewing the list of comments in the Comment Manager. When offensive, it's marked as red. Active or deactivate a comment by clicking the correct link. When activated, the comment is white when viewing the list of comments in the Comment Manager. When deactivated, it is red. 4.3. When you mark a comment as spam, it will be permanently removed from the system after you click Save. This action cannot be undone. If you want to have an effect on future spam, don't delete comments. Instead, Mark as Spam. Learn more here: How do I limit spam in comments? 5. To enable comment moderation, click Settings next to Comment in the navigation. 6. Enable moderation and notification within the Comment Manager Settings. Prev: How do I associate PDFs, photos, video and other media with articles or blog posts? Next: How do I find and edit an existing author?